I know there are many out who have started doing K2 blackpearl projects and have been looking for more guidance and training. The K2 blackpearl 101 course is a good introduction, mostly for sales, but not great for a heads down developer. The K2 blackpearl Wrox book will be done really soon – I am counting down. You can find it on Amazon right now and pre-order if you wish. I have asked for some deeper dive technical training materials for developers and see where this goes. 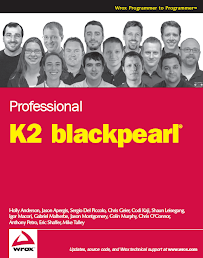 However K2 pulled together a new K2 blackpearl Best Practices whitepaper (KB000352). It has tons of good stuff on everything from best practices on designing SmartObjects, gathering requirements, project set up in Visual Studio, logging, data field usage, rules, versioning, process sizing, exception handling, deployment, etc. I highly recommend you give this a read.